The brothers Filip and Luka Vidovic became noticeable by their acting and illusionist skills, and in collaboration with Animal Friends Croatia they came together in front of the cameras to join the forces for abandoned animals and to encourage everyone to experience the magic that adoption brings. The likeable duo in the video, featuring dancer Sara Ugrinic, break-dancer Juraj Horvat and the illusionist Aryan Ivankovic, uses a role reversal to encourage viewers to put themselves in the situation of abandoned dogs and their hard journeys to new homes. 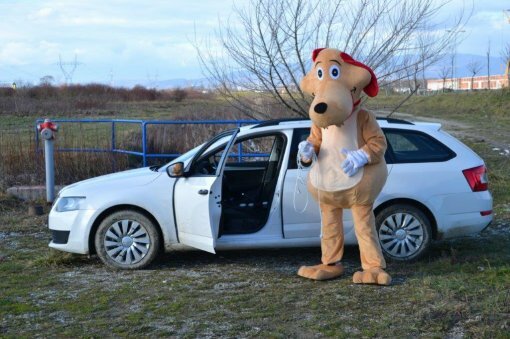 In addition to the video, the Brothers Vidovic and Lola the dog are also encouraging adoption via billboards that will be put up in Zagreb, Osijek and other cities. "It makes me sad when people abandon their animals and leave them to get by on their own, even though they are aware they might get run over by a car or end up in a kennel of an overcrowded shelter. This campaign is a real opportunity to show people how it would be if we swapped places and how important it is to show humanity," says the magician Luka Vidovic. Filip Vidovic, "Gypsy, but the most beautiful one," in the currently popular show, adds: "My puppy, Lola, also a participant of the campaign, was adopted from a shelter and I consider it the best decision I've made. Animals are not objects but conscious living beings and family members. Do not buy dogs or any other animal, instead adopt an abandoned dog or a cat and do a good deed." The "Adopt" campaign aims to emphasize the importance of adoption and to encourage people to opt for an adoption of animals from shelters rather than buying them, thus supporting selective breeding and trade in living beings. Dogs in shelters are vaccinated and neutered and they’re under constant veterinary care, and these are just some of the benefits of adopting instead of buying. The Shelter for Abandoned Animals of the City of Zagreb in Dumovec, where the video was shot, has joined Animal Friends Croatia’s campaign, along with the Victories Association from Osijek and the support of the Animal Protection Network. The Animal Shelter in Dumovec currently has about 200 dogs in its care, who have ended up in a shelter because someone abandoned them, and other shelters in Croatia are full of dogs waiting to be adopted. If everyone who considers buying would choose adoption, all the shelters would be empty. The campaign organizers believe these direct and human messages will reach as many people as possible and result in a more responsible animal care. Abandoning animals is a shameful and cruel mistreatment, punishable by a fine of between 15 and 30 thousand kunas. Let's join Luka and Filip in the "Adopt" campaign and say NO to abandoning, NO to buying and a big YES to animal adoption! Ana Mihalic took and edited the photos, the make-up artists were Petra Sever and Andrea Leko, and the video was made and edited by Roberto Turk. Photo gallery from the "Adopt" campaign shooting.